On August 25, 2017, Hurricane Harvey (a Category 4 storm) made landfall on the southern Texas coast as one of the most damaging storms to hit one of the United States’ largest cities. What followed was catastrophic flooding that affected millions of Gulf Coast residents, businesses and the overall energy market. The true impact to the region’s vital oil and gas markets is still unfolding, but the disaster has raised concerns about gas pricing spikes, refinery operations and network resilience. Hurricane Harvey caused moderate and temporary reductions to Texas Gulf Coast onshore and offshore production. As the hurricane approached, offshore platforms in the path were evacuated, and onshore production activities were halted, leading to a decline in gas supplies. During the last week of August, offshore Gulf of Mexico production was reduced by approximately 21 percent,or 700 million cubic feet per day (MMcf/d), when compared to the prior week. Onshore conventional production along the Texas Gulf Coast over the same period also declined by approximately 8 percent, or 96 MMcf/d. Further inland, the Eagle Ford Shale saw a temporary 10 percent reduction, or approximately 450 MMcf/d, across the dry, associated and wet windows. Natural gas consumption along the Texas Gulf Coast also was affected by temporary declines in power generation and pipeline exports to Mexico. Fortunately, Hurricane Harvey ushered in a few days of cooler weather, reducing gas demand for power generation by 1.0 billion cubic feet per day (Bcf/d). Gulf Coast pipelines saw several force majeure declarations that reduced gas pipeline exports to Mexico, where some of those gas supplies were redirected to Southeast markets. Regional Texas Gulf Coast gas prices in the Houston Ship Channel, Katy hub and Agua Dulce rose temporarily for a few days before falling back to the weekly average. While crude oil prices have remained unaffected, gasoline and diesel prices steadily have risen. Gulf Coast Ultra-Low Sulfur No. 2 diesel spot prices rose from $1.58/gallon prior to the arrival of Hurricane Harvey to $1.72/gallon over the following two weeks. Just a few weeks later, on September 10, 2017, Hurricane Irma made landfall in South Florida, bringing powerful hurricane-force winds and extensive flooding. The natural disaster led to a power outage that impacted more than 90 percent of Florida residents in the region. Diminished gas demand for power generation in Florida and the Southeast lasted for roughly seven to 10 days, as electric utilities began restoring power to homes. The ability to restore power to residents in a relatively short amount of time reflects, in part, improvements in crisis management and significant infrastructure investments made in the last decade. With limited supply and pipeline disruptions, the oil and gas industry has made strong efforts to improve on its response to natural disasters and its use of evolving technologies to identify problems and engage with customers. Hurricane Harvey’s impact on overall energy markets has been limited, as natural gas production and consumption have steadily recovered after the passing of the storm. The diminished proportion of offshore Gulf of Mexico production, coupled with onshore shale gas production growth, has played a role in reducing current price impacts compared to previous natural disasters such as Hurricane Katrina. 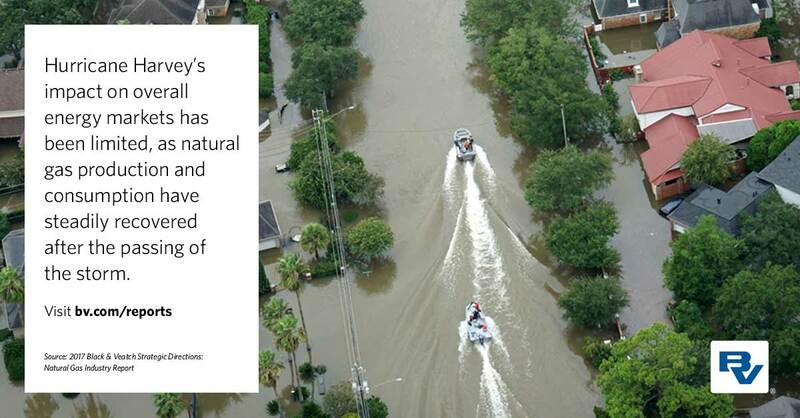 Further, taking lessons learned post-Katrina, the natural gas industry has made significant strides to improve safety and crisis management during natural disasters. The muted impacts of Hurricanes Harvey and Irma on the oil and gas market exemplify how far the industry has come in supporting infrastructure resilience and reliable supply.